Attract Magnetic Wreath Hanger 2-pack is designed for metal and single-pane glass (DOES NOT WORK ON DOUBLE PANE GLASS) doors or windows. The Attract Magnetic Wreath Hanger is the perfect solution to the question of how to hang your wreath. No more questioning whether your door will be able to close as with traditional over-the-door style hangers. Extra strong magnets hold wreaths up to 10 lbs. The Attract Magnetic Wreath Hanger holds tight without leaving any marks on the door. The backside of the magnetic hook has a soft padding to protect your door or glass from scratches. Extended hooks provide leverage for easy removal. Use for Christmas and seasonal wreaths year-round. Made to Use indoors and outdoors. Sold in packs of two. Only one is needed on a metal door. Two are needed for glass, placing one magnet on each side. The magnets will hold through most single paned glass! *Works on most metal surfaces but not all (e.g. aluminum) Still not sure if this will work on your metal door? Test a refrigerator magnet on your door, if it sticks, so will this product! Sold in packs of 2 (i.e. 2 of the exact same magnetic wreath hanger). Only one is needed on a metal door. Two are needed for glass, placing one magnetic hanger on each side. Indoor and outdoor use. Attract magnets are extra strong and hold even heavy wreaths- up to 10 lbs on steel surfaces/ 5 lbs on single pane glass (DOES NOT WORK ON DOUBLE PANE GLASS). Soft padding on the back of the Magnetic Hook to protect the door or glass from scratches. Magnet has an extended hook which provides leverage for easy removal. Not just for Christmas Wreaths but can be used for seasonal year around wreaths. 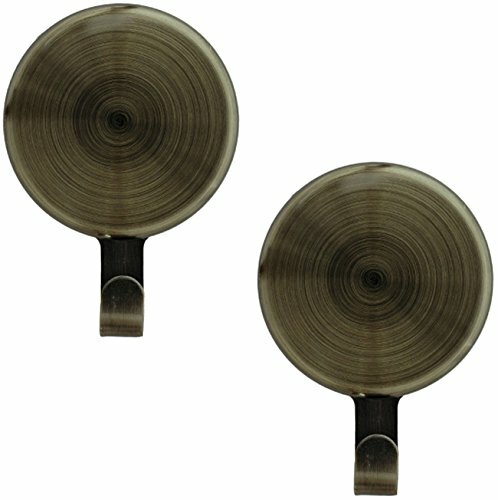 Comes in a variety of finishes - Antique Brass, Brushed Nickel, Oil Rubbed Bronze and Silver.